The next installment in Mick Herron's wry, clever CWA Gold Dagger-winning Slough House series. The Bond-esque River Cartwight and his group of defunct MI5 spies, headed by the irascible Jackson Lamb, will do anything to get back into the game. When a member of London's Slough House--MI5's stable for disgraced spies, so-called "slow horses"--is kidnapped by a former soldier bent on revenge, the agents must risk treason and breach Regent's Park to steal intel in exchange for their comrade's safety. But the kidnapping is only the tip of the iceberg as they are caught in a conspiracy that threatens not only the future of Slough House, but of MI5 itself. 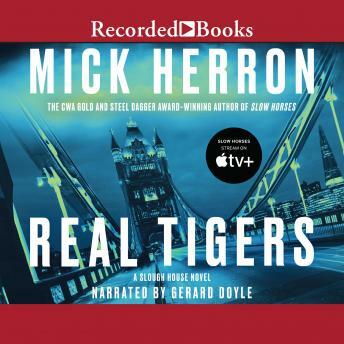 Mick Herron's previous Slough House novel, Dead Lions, won the 2013 CWA Gold Dagger, garnering attention both in the US and UK. These thrillers are complex and contemporary, with an unexpected dose of sly humor. Herron is steadily gaining traction each year in the US, and the film rights to this series have been optioned. Praise forDead Lions Winner of the 2013 CWA Gold Dagger for Best Crime Novel of the Year A BBC Front RowBest Crime Novel of the Year A TimesCrime and Thriller Book of the Year A Sunday Times Top 50 Crime and Thriller Book of the Past 5 Years "Funny, clever ... Genuinely thrilling. The novel is equally noteworthy for its often lyrical prose." --Publishers Weekly, Starred Review "Delightful ... with a dry humor reminiscent of Greene and Waugh." --Sunday Times "A great romp." --Jeff Park, BBC Front Row "Clever and funny." --The Times Mick Herron was born in Newcastle and has a degree in English from Balliol College, Oxford. He is the author of eight other novels, Down Cemetery Road, The Last Voice You Hear, Why We Die, Smoke and Whispers, Reconstruction, Slow Horses, Dead Lions, and Nobody Walks, as well as the novella The List. His work has been nominated for the Macavity, Barry, and Shamus Awards, and he has won the CWA Gold Dagger for Best Crime Novel. He lives in Oxford and works in London. Marketing and Publicity The follow up to the 2013 CWA Gold Dagger Award-Winning DEAD LIONS--we expect a lot of crime fiction review coverage in the US, Canada and the UK. Herron's profile has increased steadily since. $45,000 marketing budget. Pre-publication digital/print advertising across trade venues. Multi-stage consumer digital/print advertising One month out and on pub, commercial and mystery publication focus. Facebook and AdWords advertising. Consumer-facing pre-pub galley distro via Goodreads. IndieBound White Box mailing.